When it comes to the safety of your family, there is simply no need to compromise at all. After all, money can never purchase a life that is broken, or even worse, lost. Those who happen to be extremely well off and would like to ensure their homes will remain as safe as possible will most probably have employed a security staff of sorts, and it does not hurt either to set up a rather extensive network of video monitors around. Swann Security, a name that has been trusted in such a department for some time already, has just announced its Digital Wireless Security System. 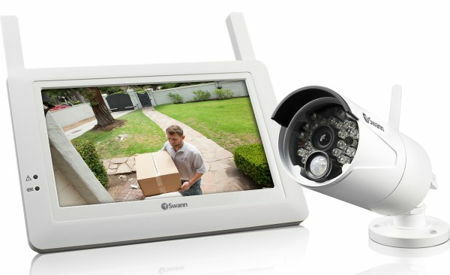 The Swann Security Digital Wireless Security System is also known as the ADW-410 Camera and Monitor with Motion Triggered Recording, where this unique plug and play wireless surveillance system will be able to offer a quick and easy do-it-yourself security solution, as well as day and night High Definition quality video which can be accessed remotely from mobile devices and tablets. Sporting a powerful 720P high definition camera, the Digital Wireless Security System can record up to a distance of 165 feet/50 meters, which results in high quality images – regardless of whether it is during the daytime or at night, thanks to its 20 IR LEDs. Not only that, the camera will boast of an integrated microphone which would enable users to have the opportunity to see, but also to hear audio up to 16 feet/5 meters. Users will be able to monitor just exactly what is happening round the clock, and will be notified through their smartphone or tablet whenever any kind of activity is registered by the camera’s motion-triggered feature. These cameras are pretty hardy, being able to be mounted either inside or outside thanks to its IP66 weather resistant rating. The system will come with an 8GB micro SD memory card right out of the box to help you get started, and the memory can be expanded up to 32GB. The asking price? $249.99 a pop.